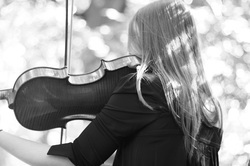 Violist Katie Magill Carrington hails from Chicago, IL, where she studied with Mr. Michael Hining. While under his tutelage, she soloed in Carnegie Hall with the Windy City String Ensemble, in which she also served as principal violist. Katie also won the Illinois Wesleyan Concerto/Aria competition and recognition at the Chicago Viola Society. In 2003, Katie began studies at The Juilliard School with Heidi Castleman and Hsin-Yun Huang. She has been invited to the Aspen Music Festival as a fellowship student twice and also traveled to China with the Juilliard Orchestra. After her Bachelor's Degree was conferred in May 2009, Katie matriculated at Rice University to study with James Dunham and received her Master of Music degree in May 2011. As a teacher, Katie taught private lessons in the Katy TX ISD, CyFair TX ISD, Spring TX ISD, and KIPP TX schools. Katie is a registered Suzuki Teacher for violin, for which she studied with Judy Bossuat-Gallic. She was a member of the Louisiana Philharmonic orchestra in New Orleans from 2012-2014. While in NOLA, Katie maintained a private studio of violin and viola students and was Artistic Director of the Greater New Orleans Suzuki Forum. She participates in the Breckenridge Music Festival as well, serving as principal viola. Having been blessed with exceptional teaching, she strives to impart the same to her own students.